Crush the biscuits to crumbs in a food processor or place in a plastic sandwich bag and bash with a rolling pin. Divide the biscuit crumbs between the jars. These look so delicious! And such a cool way to re-use old jam jars! Wow ! These are such little pots of creativity! Excellent! Reblogged this on Be Blessed & Fruitful 🙂. 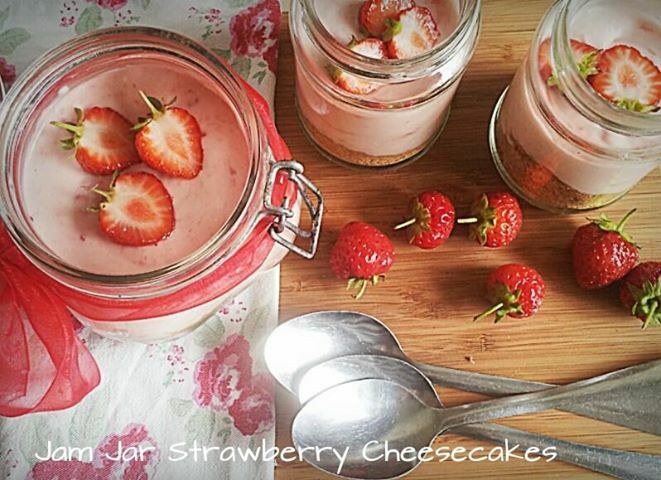 Strawberry cheesecake? Yes. Splendid! I’ll have 3. Thanks – I thought it was a great idea too.